The former couple have seen each other three times in a matter of days. If Justin Bieber was Selena Gomez’s boyfriend, the stars’ behavior over the past few days would certainly make more sense. Gomez and Bieber reconnected earlier this week as news spread that Gomez split from singer The Weeknd after 10 months together. The former couple was spotted together again on Wednesday. This time around, the two were seen biking in Los Angeles, flashing big smiles and laughing together. Bieber rocked an oversized red sweatshirt and matching shoes, while Gomez looked super cozy in an all-gray ensemble. The two were later photographed cuddling up to each other, with Gomez seen leaning her head on Bieber’s shoulder during a stop for coffee. Neither Gomez nor Bieber has addressed the rumors of a rekindled relationship, but if a casual bike ride in comfy clothing with your ex doesn’t scream “we’re dating again,” then consider us highly suspicious. The singers famously dated on and off from 2011 to 2015, forming the monolithic entity “Jelena,” which inspired leagues of young fans to feverishly root for the couple’s success. But break up they did. Both seemed to have moved on personally and professionally ― save for a shady Instagram comment here and there. Bieber has been linked to a handful of women since splitting from Gomez, including Sofia Richie and Haley Baldwin. Meanwhile, the “Fetish” singer began dating The Weeknd (aka Abel Tesfaye) sometime around January 2017. Subscribe to the Entertainment email. Get exclusives, scoops and hot takes on the news all your friends are talking about. Speculation about Gomez’s relationship status began on Sunday when she and Bieber spent the full day together, going to church and grabbing lunch. He arrived at her residence later in the evening. For once, we are all Taylor Swift. 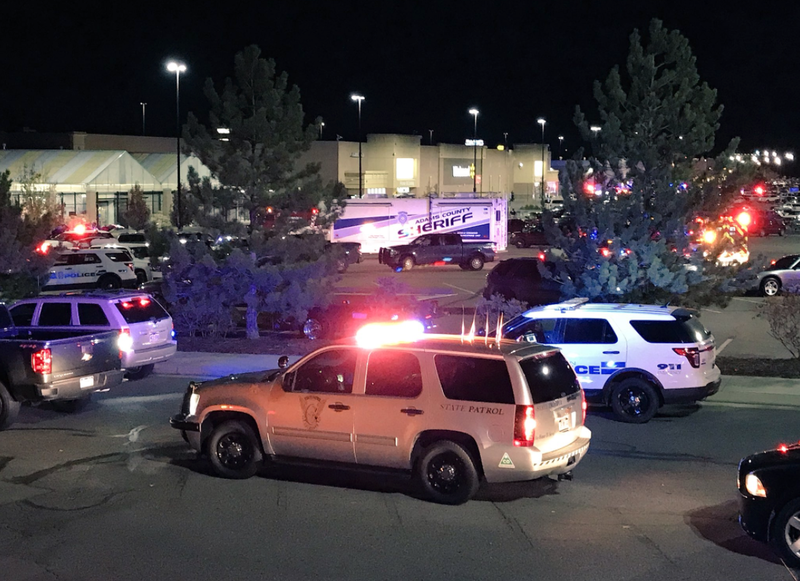 Three people were killed in a shooting at a Walmart in Colorado Wednesday night. Local police have arrested the suspect, 47-year-old Scott Ostrem. They say the shooting was random, not an act of terror. Two men died on the scene, and the woman died at a hospital. Police officials in Colorado said a man “nonchalantly” walked into a Walmart late Wednesday night, killing two men and a woman. The suspect, 47-year-old Scott Ostrem, initially fled the scene, but Thornton Police Department officers were able to track him down and bring him into custody Thursday morning. NBC 9 reported that federal authorities and Aurora SWAT members also responded to assist local police officers. The Thornton Police Department confirmed the deaths of two men and a woman on its Twitter account. The two men died on the scene, and the woman died at a hospital. The police department also said the shooting appears to be random, and haven’t identified a motive at this time. Witnesses reported hearing multiple shots at the Walmart, and videos of the scene show an empty store with uniformed police officers nearby. The shopping center contains several stores and restaurants, according to The Denver Post. Queen Bey will voice Nala in the live-action musical drama for 2019, alongside a sparkling cast that includes James Earl Jones, John Oliver and Seth Rogen. We’ve already seen successful reboots for “Jungle Book” and “Beauty and the Beast,” so it wasn’t surprising to hear in late 2015 that beloved 1994 animated film “The Lion King,” which spawned a hit Broadway show, would also come back for another round. On Wednesday, Walt Disney Studios revealed the cast of the live-action remake on Twitter, and it’s amazing. “The Lion King” tells the story of a young lion whose father is the lion king until an evil uncle plots to dethrone him. As an adult, Simba returns in an attempt to take back the throne. The film will also feature Chiwetel Ejiofor as bad uncle Scar; Alfre Woodard as Sarabi; John Oliver as Zazu; John Kani as Rafiki; Seth Rogen as Pumbaa; Eric Andreas Azizi; Florence Kasumba as Shenzi; Keegan-Michael Key as Kamari; JD McCraryas young Simba; and Shahadi Wright Joseph as young Nala. “The Lion King” will be in theaters in July 2019. Judge and Bellinger kicked off a week of MLB awards Monday by being named Rookie of the Year in their respective leagues. Dodgers first baseman Cody Bellinger was incredible all season long, much like Yankees slugger Aaron Judge. However, the Rookie of the Year canidates have made history this postseason for all the wrong reasons. Judge set the record for most strikeouts in a single postseason with 27 as the Yankees were eliminated in the AL Championship Series. That’s a number very few people thought was achievable but Bellinger was able to do him one better. Bellinger struck out three times in Game 7 of the World Series Wednesday night and to bring his strikeout total to 29 this postseason. He has struck out 17 times in the Fall Classic alone which is also a record. It’s only fitting that in a season where MLB set a record for home runs and strikeouts in a season that the AL leader in home runs and the man that was second in the NL in home runs would set an all-time record for postseason strikeouts. At least Bellinger took 15 games to reach the infamous mark, while Judge took only 12. This year’s Black Friday deals at Costco have leaked out extra early by way of bestblackfriday.com. The sales at the members-only warehouse begin as early as November 5th this year and run until November 27th, while online deals begin on Thanksgiving and run through the 27th. Since it’s an early leak, there may be more deals from Costco to come. The highlights include bundles for the PS4 and Xbox One, as well as $150 off the HP Omen gaming monitor. Most of the prices are listed below, but for some, Costco has only listed the discounts. Costco also will have a variety of other TV deals, but isn’t announcing the discounts on those until the specific sales begin on the 17th — we’ll continue to update this post as we get more information. Update November 2nd, 12:11PM ET: This article was updated with new links to more Costco deals and the correct link to the Dell XPS 13 QHD+ Touchscreen Laptop. Never mind that Harding sometimes was forced to urinate on the ice, according to people who knew her then. Or that at the outdoor rink she was shivering in her frilly chiffon skating outfit. If Harding protested, her mother, LaVona Golden, “slapped her across the face,” once so hard that she was knocked off a stool, said Pat Hamil, whose daughter, Jeannine, skated with Harding. Golden wanted her daughter to be No. 1 and wanted it badly. When Harding said that she was seeing “dollar signs” after winning the national championships this month, she was echoing her mother’s vision of what skating could do: Take her daughter far away from the trailer park poverty in which she’d been raised. That relationship is showcased in the newest trailer for the upcoming ‘I, Tonya’, the highly anticipated movie about the disgraced former figure skater. Harding’s mother is played by Allison Janney. The official trailer for @ITonyaMovie is HERE. Can’t wait for you to see #ITonyain theaters this December! The movie hits theaters in New York and Los Angeles in December and nationwide at the start of 2018. It’s no big secret that Razer (the company best known for building gaming peripherals and laptops) has been building a phone. The company bought fledgling smartphone maker Nextbit earlier this year, and there’s been talk of a Razer phone ever since. Dual 12-megapixel cameras on the rear with different levels of optical zoom — one wide angle, one telephoto. It’ll run Android Nougat 7.1.1 at launch, with plans to update to Android Oreo (8.0) in the first quarter of 2018. I got to go hands-on with the device a few days ago, and I’m looking forward to spending more time with it for a review. For now, I’ll say: The device looks and feels well-built, the speakers were nice and loud and the 120hz screen seemed buttery smooth. In what seems to be an unstoppable trend at this point, there’s no 3.5mm jack here. The company tells me they needed that space for the battery and the speakers. On the upside, there’s a THX certified 3.5mm to USB-C DAC adapter in the box. If you’ve ever held the previous phone made by the Nextbit team, the Robin, the Razer phone feels a bit like the bigger, badder evolution of that. If there’s a parallel universe where Nextbit lived on independently and made a “Robin 2 XL,” it’d probably look a lot like this (minus, you know, the Razer logo on the back). They’ve understandably dropped some of the software features that were unique to the Robin in its time. The Robin would, for example, automatically back your photos up to the cloud and remove the local copies to save space. Shortly after the Robin’s debut, Google rolled similar functionality into Google Photos right within Android and made the whole thing a bit redundant. The phone will cost $699 at launch. Pre-orders should go live shortly, and it’ll ship in North America and Europe on November 17th. 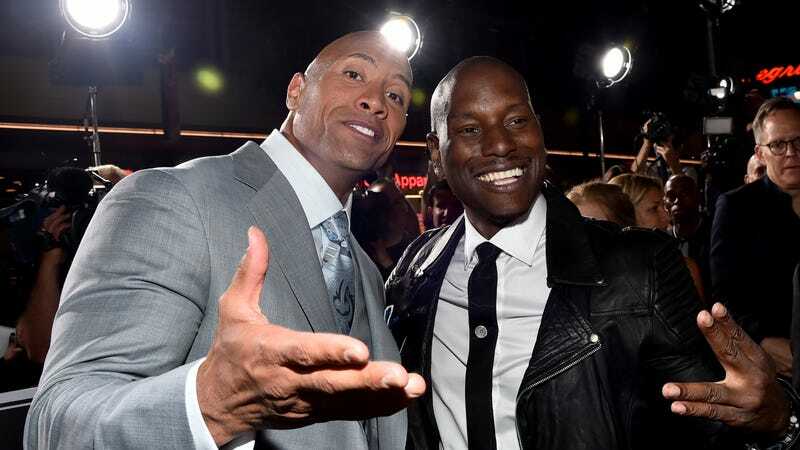 Here’s a quick spot of career advice for any readers in our audience who are—or might someday be—Fast And The Furious B-lister Tyrese Gibson: If you’ve reached a point in negotiations where the sentence “You can either have me in your movie, or The Rock, but not both” has passed your lips, we regret to inform you that things are not going very well. Gibson escalated his ongoing, largely one-sided feud with fellow series star Dwayne Johnson via Instagram today, typing out a series of posts that ended with a direct ultimatum, presumably aimed at the Fast series’ producers: “Hello world………. hello loyal fans and loved ones from OUR fast universe…….. I’m sorry to announce that if Dewayne is in Fast9 there will no more Roman Peirce – You mess with family and my daughters survival I mess with yours……… close your eyes dude you’re a ‘Clown’……” Gibson even invoked the dreaded candyass insult/hashtag that marked Johnson’s fight last year with Vin Diesel on the set of The Fate Of The Furious, in what we can only assume is the misguided belief that his character, wisecracking car thief Roman Pearce, is as vital to the franchise as either Johnson’s or Diesel’s. It’s window dressing. It’s subterfuge. It’s pretense. Whatever it’s called, LSU’s offense is dripping with it. This is Tigers offensive coordinator Matt Canada’s specialty. Using pre-snap motions, a variety of looks and a slew of personnel packages, he’s a master at deception. Alabama coach Nick Saban addressed the media during the SEC coaches teleconference on Wednesday. Before Canada arrived in Baton Rouge, LSU’s offense was accused of being boring, conventional and basic. Figure out how to win at the line of scrimmage and chances are the Tigers would be stuck in neutral. “LSU is just a team that likes to establish the run, and we’re a team that (likes to) establish stopping the run,” said Alabama defensive tackle Da’Ron Payne. The Crimson Tide understood the terms of this game and recognized what it took to prevail. In the last seven meetings with the Crimson Tide — six of which resulted in losses — the Tigers have failed to score 20 points. Last season, they produced zero. When Orgeron hired Canada away from Pittsburgh last December, he did so with the intent of spicing up the Tigers’ drab offense. He wanted tempo, exotic packages and a football version of trompe-l’oeil. He got that. But it has taken LSU a while to adjust, as the Tigers went through growing pains. LSU scored only seven points in a loss to Mississippi State and controlled the ball for 25 minutes in an embarrassing defeat to Troy. But there are signs the Tigers are on the rebound after accumulating 593 yards and 40 points in a victory over Ole Miss on Oct. 21. They have also proved to be a more challenging study than in years past, Saban conceded. For the Crimson Tide, focus, discipline and preparation will be as important as the brute force typically required to win an Alabama-LSU matchup, defensive back Minkah Fitzpatrick said. After all, Canada’s plan is to create confusion. If that’s the case, Orgeron is banking on Canada having another trick up his sleeve. Shares of Mark Zuckerberg led Facebook Inc (NASDAQ:FB) have picked up some momentum ahead of the social media company’s Q3 earnings gaining nearly 6% over the past three trading sessions. 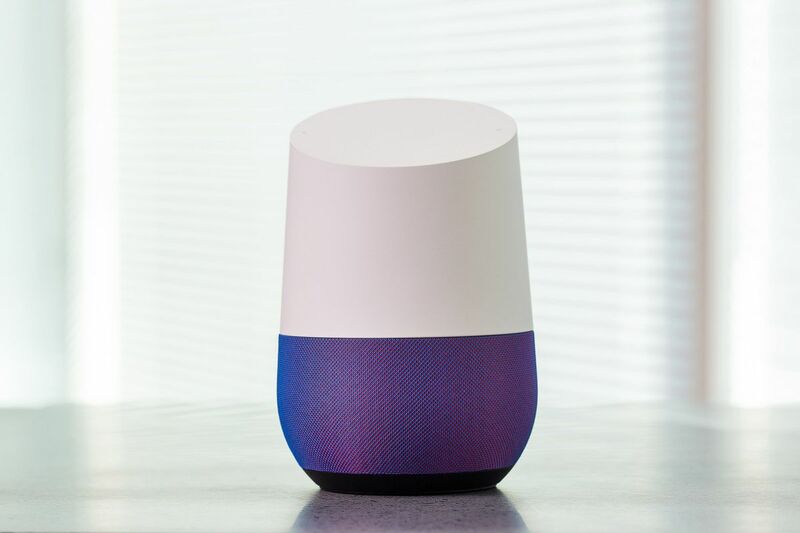 The Menlo Park, California-based company is scheduled to report its Q3 earnings today after the closing bell. And, the sentiment is little overly bullish on account of overall bullish sentiment around tech stocks. The question now is, whether the latest quarter earnings would set FB stock for big post-earnings similar to the likes of tech giants Microsoft (NASDAQ:MSFT), Amazon (NASDAQ:AMZN) last week. With Google parent Alphabet (NASDAQ:GOOGL) also delivering another strong performance, the expectations from Facebook earnings have also gone up. Coming to Wall Street estimates, The average analyst estimates for the tech behemoth’s fiscal third quarter are a non-GAAP EPS of $1.28 per share on revenue of $9.84 billion. These numbers imply a 18% YoY EPS growth, and 40% YoY revenue growth. Facebook has a strong history of beating earnings estimates. However, the recent controversies which the social media giant was embroiled had hurt the sentiment around FB stock. There are still apprehensions about FB stock on account of the Russia ad controversy. Having said all this, for many investors the question now is, should one buy the Facebook stock ahead of earnings? For a detailed preview of the FB stock’s Q3 earnings and more insights about how to play Facebook stock ahead of earnings, please go through our Facebook earnings preview. Can Q3 earnings give some impetus to running out of steam Tesla Inc (NASDAQ:TSLA) stock? Palo-Alto, California based electric carmaker Tesla Inc (NASDAQ:TSLA) is scheduled to report its third quarter earnings today, after the market close. Shares of the Elon Musk-led company have gone almost nowhere since the last quarter earnings and in fact, Tesla stock has corrected more than 11% till yesterday over the past two weeks, only to see a slight bounce in the last trading session. Investor sentiment is not as ultra bullish as it has been in the earlier part of the year as valuation concerns are catching up. All Tesla bulls could be betting on the company’s Q3 earnings to help TSLA stock resume its uptrend. However, Model 3 narrative holds the key for Tesla stock in the coming days. The Wall Street consensus expects the company to report a non-GAAP loss per share of $2.3 per share and a revenue of $2.94 billion. The analyst estimates imply a healthy 27.8% YoY top-line growth by but a drastic drop in earnings of more than 400% YoY as the company posted an EPS of 71 cents per share in the year-ago same quarter. If the company continues the same way then there are valid concerns that Tesla could soon run out of cash as the losses have almost doubled from the previous quarter. Tesla stock is now majorly a bet on the Model 3 success. Any negative development on the Model 3 production front in the earnings call could be really fatal for Tesla stock. Tesla stock is a high-risk high reward bet going into earnings. Further, the earnings whisper number of loss per share of $2.54 is not encouraging as it suggests a big earnings miss could be on the cards. The sentiment ahead of earnings is also that bullish, investors would do well to avoid TSLA stock ahead of earnings. Can Q4 Earnings lift QUALCOMM, Inc. (NASDAQ:QCOM) stock? The third major earnings for the day is smartphone chip giant QUALCOMM, Inc. (NASDAQ:QCOM) which will report its Q4 earnings today after the market close. Shares of Qualcomm crashed by nearly 7% as reports of Cupertino tech giant Apple (NASDAQ:AAPL) working on next model of iPhones without the company’s components emerged. Already, the San Diego, California based chipmaker is engaged in numerous legal battles with Apple, this news had just made matters worse for QCOM stock. The Q3 earnings suddenly almost taken a back seat when it comes to Qualcomm stock’s fortune near-term with now all eyes on the development with Apple, as it still happens to be one of the biggest clients of the company. However, Qualcomm shareholders would be hoping that company’s Q4 earnings would help the recovery in QCOM stock. Wall Street expects the company to report a revenue of $5.8 billion, translating to a 6% YoY decline. Coming to earnings, the Street’s consensus estimate for EPS is a non-GAAP earnings of 81 cents per share, worsening from the year-ago quarter EPS of $1.28, a massive 47 cents decline. Now, Q4 earnings could be the lifeline to stem the rot in QCOM stock. For a detailed preview of the Qualcomm stock’s Q4 earnings, please go through our QCOM earnings preview. Some other major earnings today are of action camera maker GoPro (NASDAQ:GPRO) and smartwatch company Fitbit (NYSE:FIT). Both companies will report earnings after the closing bell. GoPro is expected to report a non-GAAP earnings per share of 2 cents per share on revenue of $313.1 million. On the other hand, analysts expect Fitbit to deliver a loss per share of 4 cents per share and revenue of $391.78 million. Looking for fundamentally better tech stocks? Check out Amigobulls’ top stock picks from the tech sector, which have beaten the NASDAQ by over 165%. Interested in automotive stocks? Then, we also have our top picks from the auto sector, which have beaten the S&P 500 by a massive 297%. If you’re a trader though, you should check out our daily trading ideas section for daily, free updates on the latest crossovers and other popular technical signals.